A recipient of the 2006 Philippine Presidential Award for Outstanding Filipino individuals and organizations overseas, at age 19 Adolovni Acosta won first prize in a national piano competition sponsored by the Music Promotion Foundation of the Philippines. She was elected to the U.S. National Honor Society in Music, Pi Kappa Lambda, by the faculty members of New York University Department of Music and the Performing Arts Professions. In the United States, she studied piano for fourteen years with four different teachers. Adolovni has performed solo recitals in Europe, the Middle East, North and South America, Asia, and the Pacific and has conducted master classes, in addition to performing recitals, in conservatories and colleges of music in Australia, New Zealand, Vietnam, Malaysia, Brunei, Singapore, Thailand, Myanmar, the Philippines, India and Nepal (at KJC). Her recordings and performances have been broadcast on radios and televisions in many countries. On the invitation of the Embassy of the Republic of Poland in India, in March 2010 Adolovni launched the “Year of Chopin in India 2010” with “Tribute from Asia” in Pune, and gave the inaugural concerts in New Delhi, Kolkata, and Bangalore. She has also performed at The White House in Washington, D.C. for former first lady Rosalyn Carter, and at Malacañan Palace in Manila in the presence of former Presidents Gloria M. Arroyo and Fidel Ramos. Adolovni has taught at the Juilliard School Pre-College Division, New York University Department of Music and the Performing Arts Professions, Hunter College of the City University of New York Department of Continuing Education and the Usdan Center for the Creative and Performing Arts. 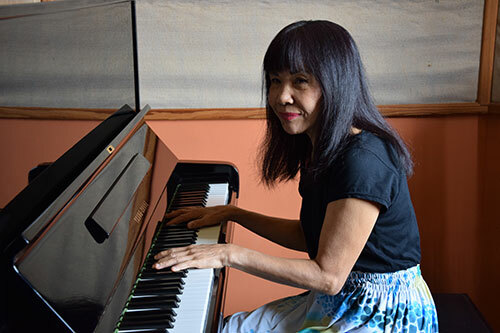 A permanent resident of New York City, she is a visiting specialist professor at Mahasarakham University College of Music in northeast Thailand.